Many of us worry about income inequality in BC, and so we should. But here’s the thing—bad as income inequality is, wealth inequality is worse. And in our province, that wealth inequality is driven in large part by real estate—who owns it, and who doesn’t. The ownership of real estate wealth in BC is highly unequal, even when it comes to principal residences. As debates unfold about the Speculation Tax and extra School Tax on properties over $3 million, this starting point of inequality in property wealth is important to understand. To shed some light on the issue, let’s revisit an analysis that originally appeared in my colleague Marc Lee’s excellent 2016 report on BC’s housing crisis. I update a key chart below, using recent Statistics Canada data that was unavailable at the time of the report: StatsCan’s Survey of Financial Security offers a useful window on the concentration of property wealth in BC. The Survey shows that the most affluent households own the bulk of real estate wealth in BC. 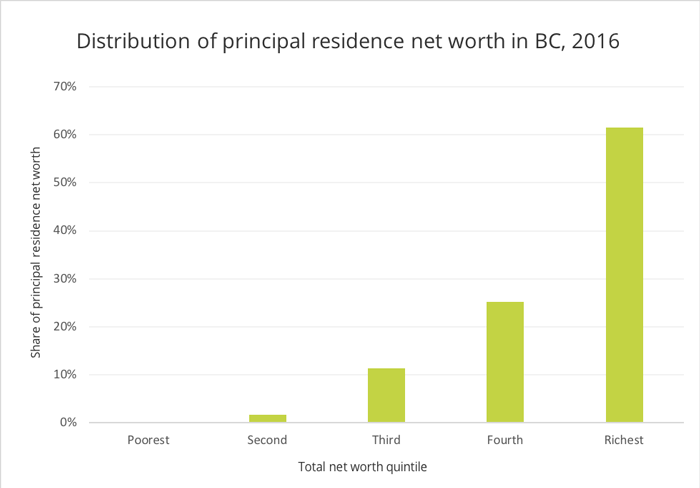 Specifically, the richest quintile (1/5th) of households now hold 62% of the net worth of principal residences in BC, and the top two quintiles together hold 87% of this wealth. Note these “net worth” figures subtract outstanding mortgage debt from the value of the property. The three least wealthy quintiles—60% of households—hold the measly remaining 13% share of principal residence net worth (and the bottom two quintiles hold almost none at all). Source: Survey of Financial Security, 2016. Note: quintiles are based on overall net worth of the family, including all assets and debts. Statistics Canada withholds precise estimates for the property wealth of the lowest quintile, but after subtracting the top four quintiles from the total, only about 0.1% of the principal residence value is left to be attributed to the lowest quintile. Properties that are not the principal residence of the owner (classified as “other real estate” in the survey) are even more unequally distributed. The top 1/5th of households own 80% of the net worth in this category, and the top two quintiles hold fully 95% of this property wealth (not shown). The upshot? Huge windfalls of land wealth we’ve seen in parts of BC recently have flowed largely to the affluent. To get a sense of the scales involved, consider that land value increases in a single year for single-family properties in the City of Vancouver alone were $47 billion in 2016—double the income earned from actually working in the city that year (and about equal to the operating budget of the entire provincial government). When you look province-wide, property wealth has grown by more than more than $1 trillion since 2007. Given that the richest households own the large majority of real estate wealth, they gain by far the most from this bonanza. The housing affordability crisis we face in BC is also an inequality crisis—another manifestation of the growing gap between the rich and the rest of us. Property wealth inequality is all the more unjust because the value of urban land is created collectively by all of us. Public investments in infrastructure like parks, schools and transportation make land in a given location highly sought after (and thus highly valued). Since land values—rather than building values—have skyrocketed in BC, it’s clear that the biggest gains are not a result of private investments in home renovations and other building improvements. This year the provincial government took some important steps that will help capture more of this massive land value for the public good, including the Speculation Tax and additional School Tax on properties over $3 million. The new taxes are quite narrowly targeted, requiring only 1–2% of the wealthiest property owners in BC to pay more. When you take stock of the extreme inequality of property wealth in BC—and the foundations of that wealth—these steps are clearly justified. My main criticism would be that, if anything, they don’t go far enough. You can follow the links to read more of our analysis on the Speculation Tax and School Tax, our proposals for a more ambitious progressive property tax, and our recommendations for how to dramatically expand the creation of new social and cooperative housing in BC.